SpiritLine Cruises & Events operates four vessels in scenic Charleston Harbor, including the grand and impressive Spirit of Carolina. This three deck luxury dining yacht is the largest passenger vessel operating in the harbor. With three other vessels varying in size and amenities, we are sure to be able to accommodate your needs. No other venue in this city can offer such a unique space, spectacular views, and delectable cuisine with warm southern hospitality. There is certainly no better way to enjoy our beautiful city, surrounded by water. 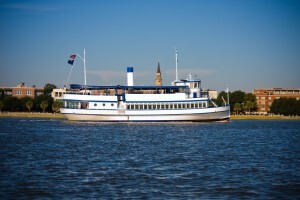 Built and designed to comfortably accommodate large groups for dining, the Spirit of Carolina hosts our dining cruises and is also available for chartered events. With two large enclosed air-conditioned dining decks and an open-air observation deck this boat has an abundance of space for any group size. Other amenities include 10 foot ceilings, atrium windows, semi-private mezzanine level dining on the lower deck, and two hand-crafted, mahogany bars. The décor is tasteful with a classic color palette. This boat also has a fully equipped galley. Elegant southern style and charm combined with functionality makes this boat a great choice for weddings and corporate events. The Spirit of the Lowcountry is loaded with amenities, starting with the spacious partially covered upper deck. When you step onto this deck you really feel like you are part of the surrounding beauty of Charleston Harbor. This boat has seven restrooms, an elevator for guests with mobility issues, two fully equipped bars, and two heated/air conditioned dining decks. The décor on this boat is one of the crowning features, with beautiful window tapestries, banquette seating and classic lighting fixtures; this boat is a true gem. This sleek, beautiful two deck dining yacht is perfect for entertaining on the water. 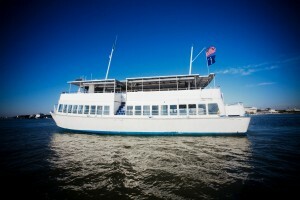 The Spirit of Charleston has an open air deck that can be fully enclosed in inclement weather. The lower deck is spacious and elegantly decorated with beautiful amber sconces for lighting and a color palette that works well with any personal style. There are two full service bars onboard. Your guests will enjoy the comfort of a dining yacht and still feel they are part of the surrounding harbor. 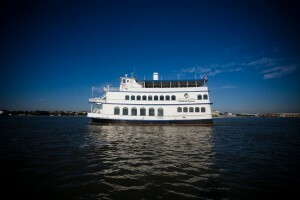 The General Beauregard is a custom designed touring vessel. It has fixed seating throughout the lower deck and space on the upper deck for entertaining and dancing. There is a large snack bar area and space for food display. This boat is perfect for fundraisers and casual events. 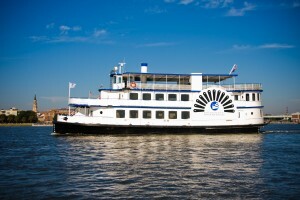 For fun on the water the General Beauregard is great choice.